My son is repeating kindergarten and was tested last year for LD (results were normal). He is doing poorly, and the school is recommending that testing be repeated. I don't understand why they are testing a second time. When children do poorly in kindergarten, there is good reason for them to be tested for learning disabilities (LD). Furthermore, it is reasonable to test them a second time a year later. Testing can be unreliable when children are under the age of seven. Actually, it isn't really the tests that are unreliable, but the children who are. Shyness, lack of confidence, difficulties with concentration can all interfere with a child's correct responses. Despite the many problems, test results can provide some important hints as to the source of your son's problems. Although the school did not find a learning disability from the first testing, a year of growth could help to reveal a disability in the second testing. It is very difficult to identify learning disabilities in young children, but be glad the school is trying to do its best to help you. Also, don't be discouraged. Many children who begin with early problems become excellent students. Although your child may have learning disabilities in kindergarten, there is good reason to have hope for his future. 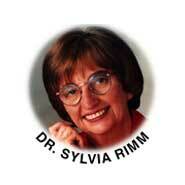 Dr. Sylvia Rimm is a psychologist and best-selling author with a national following. She is the director of the Family Achievement Clinic in Cleveland, Ohio, and is a clinical professor at Case Western Reserve School of Medicine.